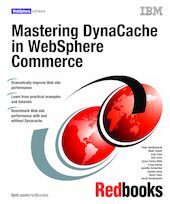 This IBM® IBM Redbooks publication describes how to use WebSphere® DynaCache to improve the performance of WebSphere Commerce Web sites. Today’s Web sites are a demanding mixture of static images surrounded by mini-shopping carts, e-marketing spots, and other eye-catching fragments, all of which change from view to view and user to user. Sites must be richly featured and personalized to attract customers – and they must deliver this content at a high level of performance as well. But the richness and personalization customers want is often the enemy of good Web site performance. DynaCache technology gives Web site developers a robust tool for achieving excellent Web site performance. It can be applied retrospectively to existing Web sites whose performance is not meeting the owning company’s requirements. It is even better applied from the beginning of a J2EE™ Web project, and will yield performance gains well beyond those achieved at a comparable cost by adding more hardware or rewriting the solution. This book leads you through an explanation of what caching is, and what is special about caching Web sites. It then describes the capabilities offered by WebSphere DynaCache and how to most effectively make use of those capabilities. The discussion is enhanced by practical examples and tutorials to help you configure DynaCache and implement a sample WebSphere Commerce store. Finally, the book describes how to approach benchmarking for an online store, and how to quantify the effectiveness of a dynamic caching policy on site performance. It also presents a case study of a real-world Web site problem that was turned around by an IBM team applying DynaCache technology.